I have been wandering the streets of Patan the last few days, often finding myself among a group of strangers, contributing to their collective response to the 18 exhibitions spread across the ancient city whose exposed walls have been given new meaning. The Bind Collective’s exhibition, however, is a wonderful contrast to the rest of the festival. Upon entering the long and narrow room on the ground floor of the beautiful Newa Chhen, I felt like I was entering someone’s living room, suddenly feeling conscious of my dirty boots. Over 50 photo-books are sprawled across the tables, with some placed inside wall enclaves like treasured photo frames. One of the photo-books I came across was Adil Hasan’s When Abba was ill. The photo-book is a sombre representation of the blurring connections between the living, as death becomes the inevitable truth. I couldn’t help but wonder if I would have ever come across Adil’s moving work if it wasn’t for the Bind Collective’s exhibit. Not many bookstores sell photo-books anymore and they are usually very expensive, making them less accessible to the public at large. The Bind Collective is in some sense acting like a moving library that goes from place to place, allowing people to engage with photo-books that strike a delicate balance between the personal and the external through photographs and text. 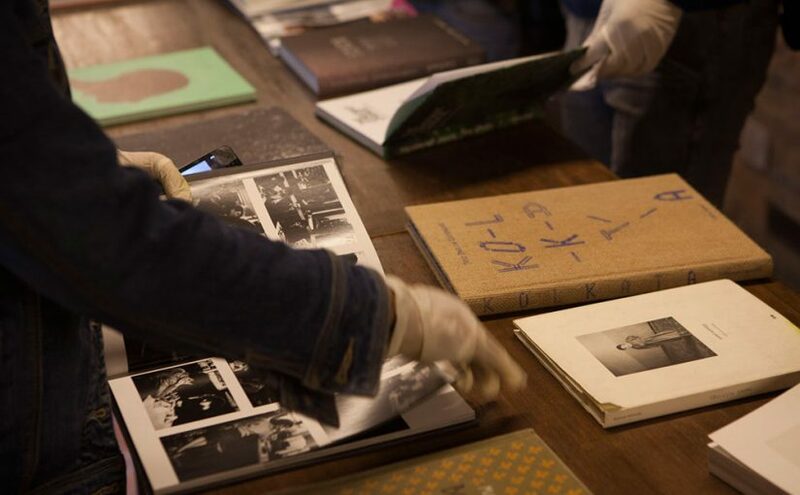 The Collective, made up of six photographers, came together to promote the medium of photo-books and to a large extent ensure their longevity by creating an archive that is made available to the public through festivals like Photo Kathmandu. With the rise in digital archiving and the consumption of photographs online, the medium maybe at risk but its ability to create intimate experiences for the viewers makes it irreplaceable. I had the chance to sit down with Asmita, Nishant and Sunil, three of the six members of the collective and photographers in their own right, who are in Kathmandu for the festival. I couldn’t help but complain about how I hadn’t given myself enough time to truly engage with what was showcased at their exhibition. ”I have seen the same people over the last few days of the festival who have either come back to look at new photo-books or to look at the ones they have already seen”, said Asmita, reflecting on not just the number of photo-books on display but also the level of engagement each photo-book may inspire. The photo-books on display are bound together with multiple layers of meaning and reveal something new to the viewer each time he or she engages with it. When I asked them about the contribution and effect created by text in photo-books, all three of them revealed that they do not read the text until they have looked at all of the photographs first. “I don’t want the text to influence the way I look at the photographs,” said Sunil. This method of engagement is understandable, as often the text may either unsettle your personal interpretation of the photographs or outright disappoint for trivializing the images. However, with a photo-book such as Life is elsewhere by Sohrab Hura, it would be impossible to engage with it without looking at the pictures and the text simultaneously. The journal-like photo-book is a complex, intricate compilation of photographs and personal notes. “I have looked through Sohrab’s book at least five times and I will probably keep going back to it because I always find myself discovering something new,” said Asmita. When I asked them to comment on the experience that the medium creates, Nishant compared it to watching a really good movie over and over again, but alone. Both Nishant and Sunil believe that the medium slows down the pace of engagement which allows the viewer a truly personal experience. Asmita also commented on the non-dictatorial nature of the engagement where the viewer’s gaze is not directed or mapped in any way. In the future, they would love to have a physical space that can be converted into a library to house all the photo-books they have, but until then they are like a nomadic troupe, travelling to different places with the photo-books they have collected over time. While the Collective has managed to break down multiple barriers restricting access to photo-books, they have also managed to create a private corner within the very public realm of the Photo Kathmandu festival.